Order Breast Cancer and other awareness/social cause design checkbook covers and check wallets in a variety of stylish designs. Complement your Check Gallery check order with our Ribbon of Hope Leather Checkbook Cover. 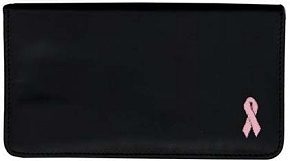 This high-quality personal checkbook cover will accommodate your favorite checks with pockets for your check register ID photos and more.